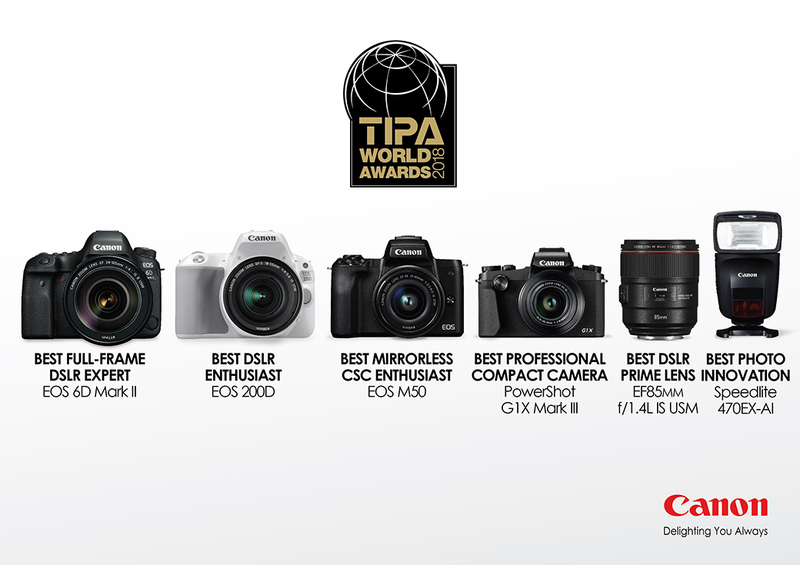 Four Canon cameras, one lens and a world leading flash have been recognised with “Best Photo and Imaging Product” awards by the Technical Image Press Association (TIPA), representing 30 photo and imaging magazines from 15 countries and regions. 1. Best DSLR Enthusiast: Canon EOS 200D. Weighing only 402 grams (body only), this compact DSLR camera is equipped with a 24.2-megapixel APS-C CMOS sensor with Dual Pixel CMOS AF and the DIGIC 7 image processor. Among many advanced features, it supports Full HD 60p video shooting and has built-in Wi-Fi and NFC connectivity for easy image and video transferring to smart devices and sharing on social media sites. 2. Best Full-Frame DSLR Expert: Canon EOS 6D Mark II. A full-frame, full-featured DSLR camera with Vari-Angle touchscreen LCD, 45 cross-type points, 26.2-megapixel sensor for image clarity event in low-light conditions, Dual Pixel CMOs AF technology and powerful DIGIC 7 image processor. The camera delivers up to 6.5 fps for continuous shooting, Full HD 60p video capability, 5-axis image stabilisation system and built-in Wi-Fi and NFC for image and video sharing. 3. Best Mirrorless CSC Enthusiast: Canon EOS M50. A compact, entry-level mirrorless camera for users looking for a smart camera. The EOS M50 is equipped with a 24.1-megapixel APS-C CMOS sensor for quality still image and 4K video, the precise and smooth Dual Pixel CMOS AF technology, the 7-axis image stabilisation system (5 axis built-in and 2 axis in lens), and a 2.36-million-dot OLED electronic viewfinder. It is capable of continuous shooting of up to 10 fps and its Touch & Drag AF feature enable users to shift focus area through touches on the LCD monitor without having to look away from the EVF. Unique is its capability to automatically transfer images to a smartphone once they are taken (via the Canon Camera Connect app), and users can also share images and video directly from the camera to social media sites. 4. Best Professional Compact Camera: Canon PowerShot G1X Mark III. A durable compact with a 24.2-megapixel APS-C CMOS sensor, Dual Pixel CMOS AF system and DIGIC 7 image processor. The camera delivers Full HD video at 60p, with 5-axis Dual Sensing image stabilization system and Touch & Drag AF. Ideal for professional and enthusiasts alike. 5. Best DSLR Prime Lens: Canon EF85 f/1.4L IS USM. This 85mm prime lens comes with the image stabilisation system that delivers up to 4 stops of compensation, a 9-blade circular aperture for beautiful bokeh effects, an f/1.4 large aperture for a shallow depth of field, and a silent USM motor. It is compact, lightweight and handy, perfect for professional and amateur photographers who wish to capture high image quality with sharp focus and beautiful bokeh. 6. Best Photo Innovation: Canon Speedlite 470EX-AI. The world’s first flash equipped with the Auto-Intelligent (AI) bounce technology that empowers users to navigate flash photography with ease. With AI bounce, the flash calculates the distance to your subject as well as the ceiling then literally swivels itself into position for the ideal bounce angle. Held every year since 1991, the TIPA Awards recognize the best photo and imaging products announced during the previous 12 months based on such criteria as innovativeness, use of leading-edge technologies, design and ease-of-use. In 1992, Canon took home its first TIPA accolade for the EOS 100 SLR camera and, over 26 separate occasions since then, has been honored with TIPA awards for a total of 87 products and technologies*.